Post-abortion trauma? Pro-choice author says it exists ! A pro-choice abortion advocate has penned an op-ed stating that the abortion lobby refuses to admit there is such a thing as post-abortion syndrome. Writing for the blog Truth-out, Genevra Reid begins by describing how she walked to the abortion clinic through a a line of pro-life protesters and then, in a very descriptive way she describes what she saw inside the abortion clinic, “I’m on what feels like an assembly-line inside the clinic, surrounded by a group of women and girls being herded from one room to the next. Undress here, get your ultrasound there, sign your papers over that way. There’s a silent sisterhood, an understanding, between us. We talk a little. “The youngest of us looks like she’s about fourteen. She’s crying because she wants her mom to be with her when it happens. 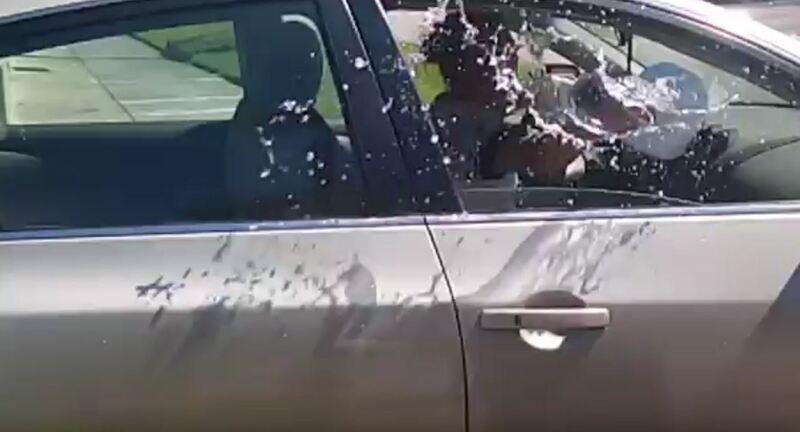 The oldest of us says she did this once before and promises the teenager that it’s not that bad. They sedate you, she says, so you probably won’t even remember it. The doctors and nurses look irritated that I declined the sedative. I didn’t have much choice. I was already four dollars short of affording the “discount” procedure, and had to find the difference by digging under my car seats for loose change. Two hundred dollars extra for sedation wasn’t something I could manage. They tell me to lie back and say it’s no worse than a pap smear. I believe them only for a moment before it feels like someone is stabbing my womb with a hot knife. My ears are ringing lividly and my vision is strobing. I can’t breathe. I feel like a trapped animal being eaten alive. This isn’t an abortion clinic, I think. They lied to me. They tricked me. They’re killing me. It hurts. Oh, God, it hurts. “BE STILL!” the doctor screams, but I can barely hear her over the ringing in my ears and the sound of my heartbeat. The nurses are holding down my arms and legs. I tell them to stop. I tell them that they’re killing me. 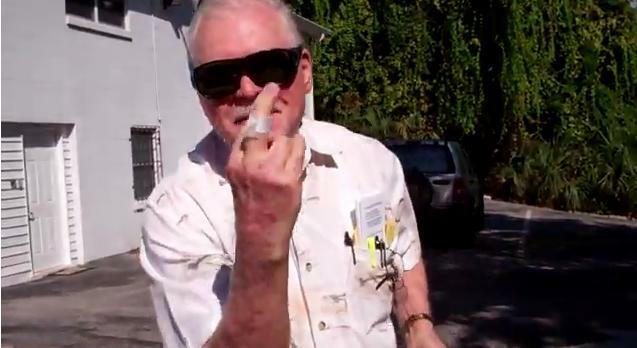 I tell them that something is wrong—very, very wrong, because it’s not supposed to hurt like this. I’m trying not to move or scream but my body is rebelling violently. I’m about to lose consciousness. Maybe I’m about to die. At once, the ringing stops and the nurses let go of me. 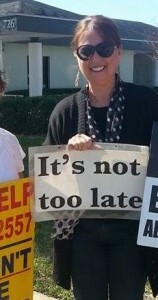 Reid continues to supports abortion but her admission to post-abortion trauma is telling! The pro-life group, Silent No More, has been bringing awareness to post-abortion syndrome for years, despite as Reid admits, denial by the abortion lobby. 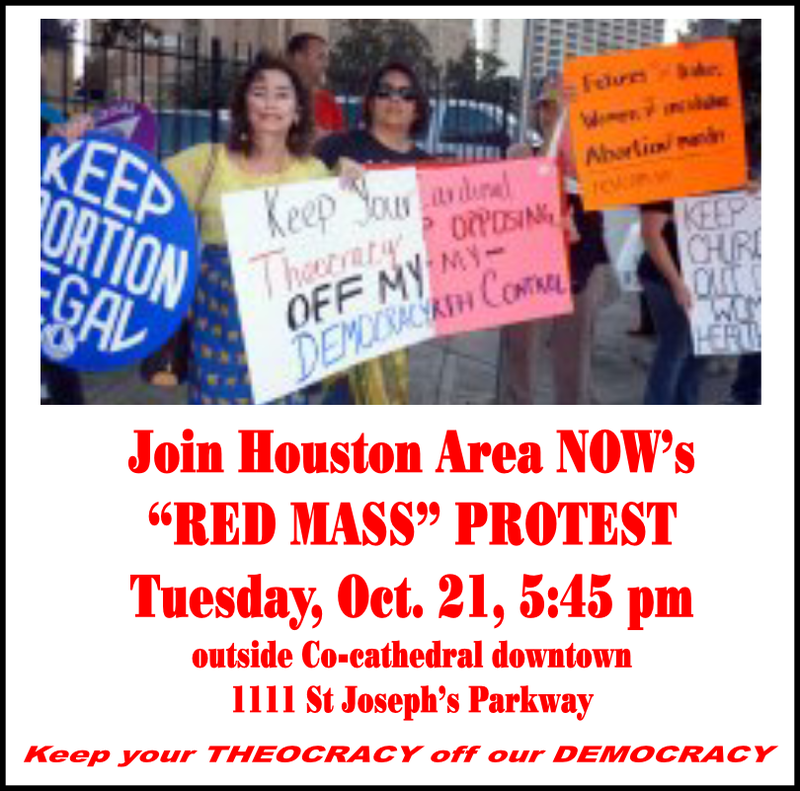 Abortion advocates are planning protests in front of a Catholic Church in the Houston, Texas area. 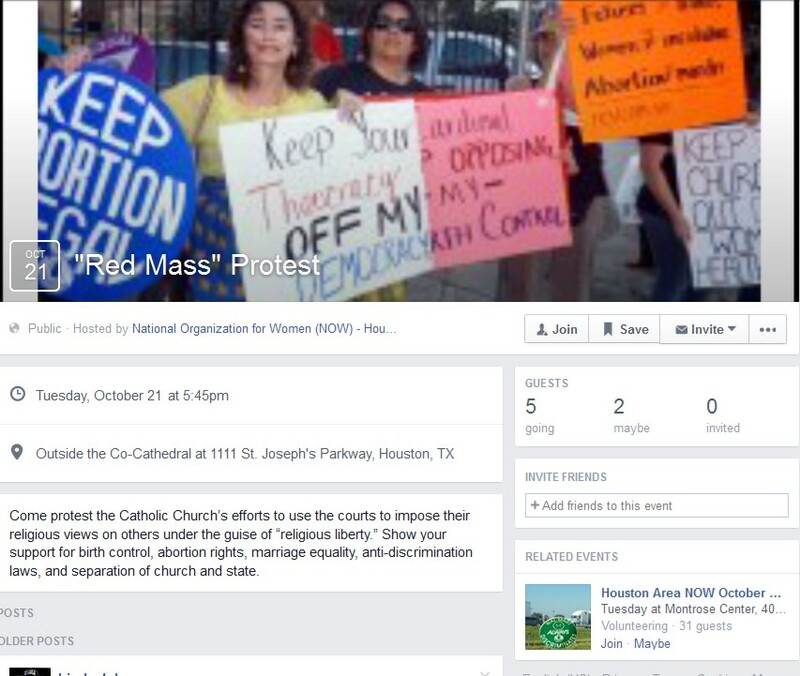 The event is hosted by Houston’s National Organization for [some] Women (NOW ) and is slated to take place on October 21 at 5:45pm Outside the Co-Cathedral at 1111 St. Joseph’s Parkway in Houston. 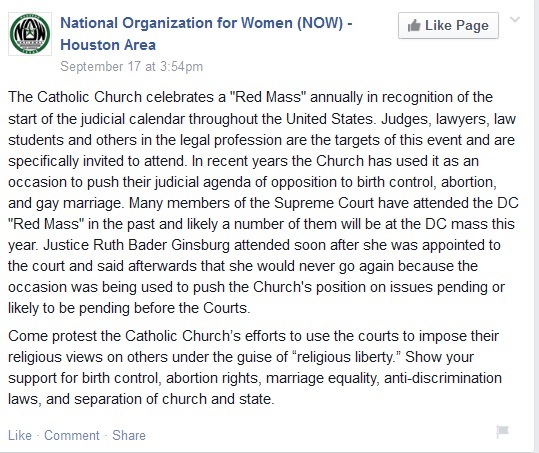 NOW writes on their Facbook page, “The Catholic Church celebrates a “Red Mass” annually in recognition of the start of the judicial calendar throughout the United States. Judges, lawyers, law students and others in the legal profession are the targets of this event and are specifically invited to attend. 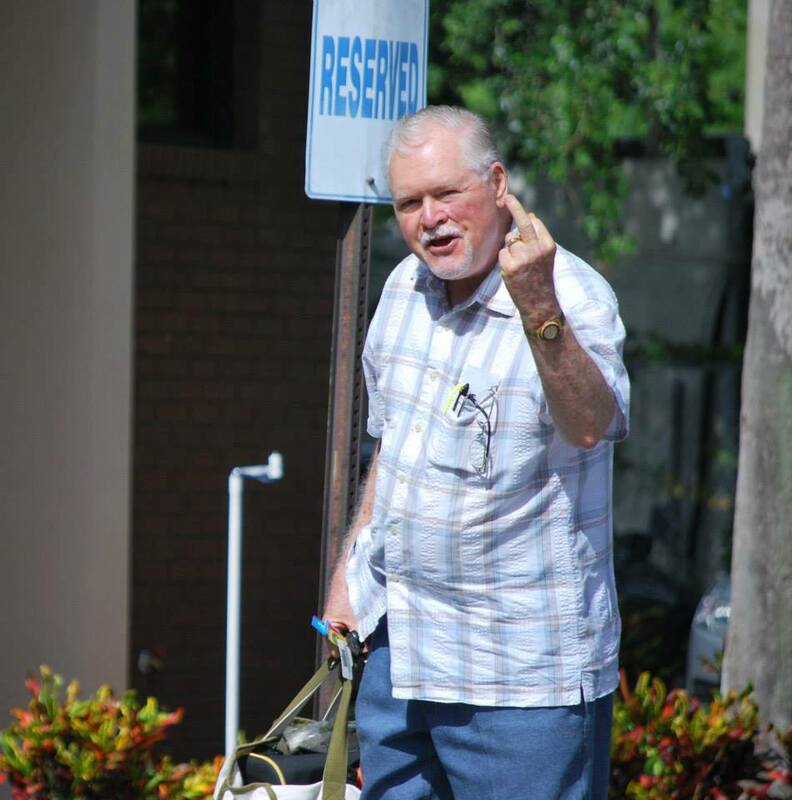 In recent years the Church has used it as an occasion to push their judicial agenda of opposition to birth control, abortion, and gay marriage. Many members of the Supreme Court have attended the DC “Red Mass” in the past and likely a number of them will be at the DC mass this year. Justice Ruth Bader Ginsburg attended soon after she was appointed to the court and said afterwards that she would never go again because the occasion was being used to push the Church’s position on issues pending or likely to be pending before the Courts. 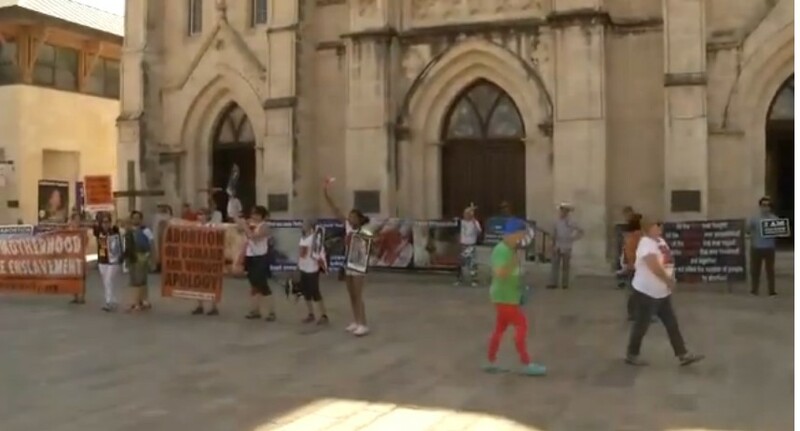 In August, the radical pro abortion rights group, Stop Patriarchy protested in front of San Fernando Cathedral in San Antonio. 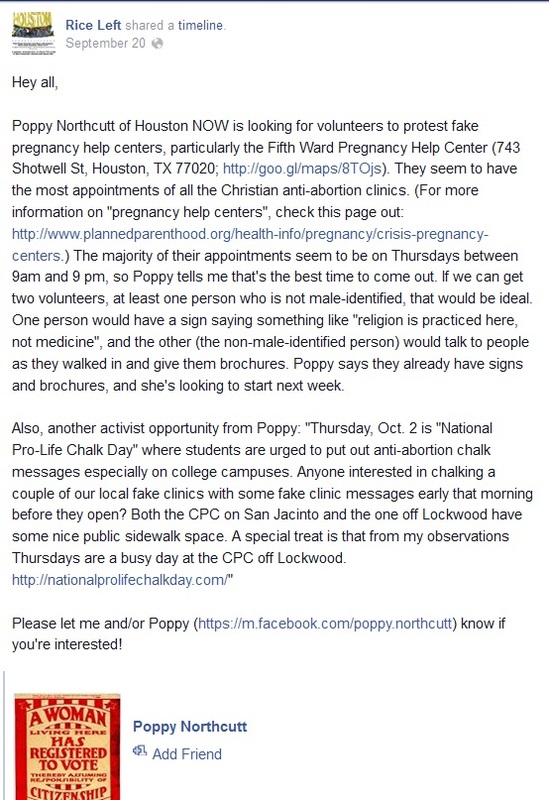 My Guess is that he Fifth Ward PHC or the churches being targeted could use some pro-life help…..maybe some of those reading this blog could offer it….